Well, this was planted in my yard by the birds...anyone know what it is? 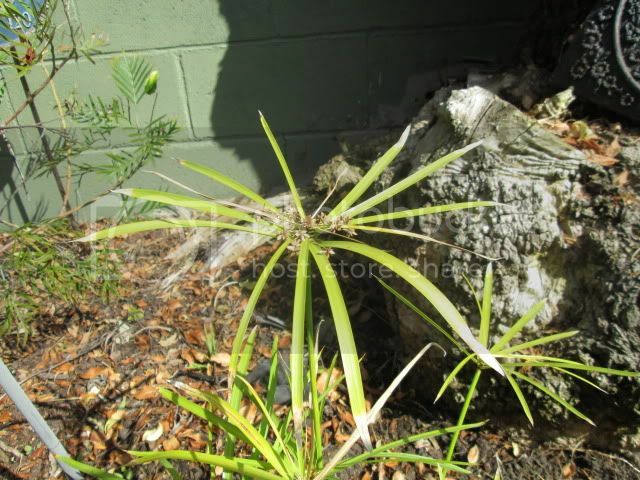 The stalks are 10 - 12 inches high, there are 12 leaves in the 'head" arranged in 4 layers of 3 leaves each. The leaf cluster is 7-8 inches across. That's Umbrella Sedge, Cyperus alternifolius. Also sometimes called "False Papyrus". Lucky you! It will take over the area, but slowly and in a controllable way. And it's pretty. Thanks...now I can find out how to properly care for it.